Mark of Caine comes from author Miles Holmes, who has a robust and engaging writing history with Skull Island and Privateer Press. Check out some of his other works as you anticipate the next chapter in the Caine saga! “Cold Steel” (No Quarter #58, 59, 61, 62, and 63): Nicolas Verendrye is a man whose loyalty can be bought with coin but whose loyalty may have its limits. As a member of the mercenary group the Steelheads, he battles his way across western Immoren, working for a host of different factions as he unravels a mystery within his own ranks. 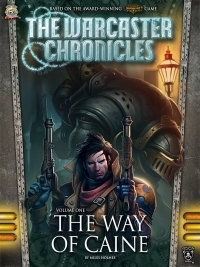 “Way of Caine” (Skull Island eXpedtions novella): In the aftermath of the Lion’s Coup in Cygnar, the warcaster Allister Caine finds himself working for the shadowy Cygnaran Reconnaissance Service to uncover plots against the royalty of the nation. 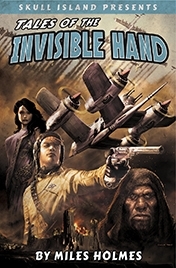 Tales of the Invisible Hand (Skull Island eXpeditions novel): In Holmes’ work of original fiction set before the dawn of civilization, a rookie pilot, Zekh, and a Neanderthal inquisitor, Gaur, find themselves caught up in a chain of events that will forever alter the course of human history—whether they survive or not.